If you have Wii games on your gift giving list this year, you will want to head to Big Lots on Sunday! 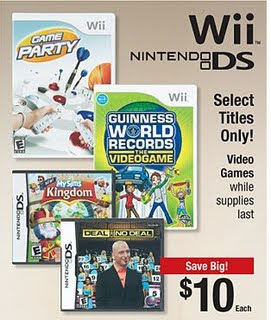 They will have select titles of Wii and WiiDS games marked down to only $10.00 each!! That is really a great price!! There will not be any rainchecks as the offer is good only while supplies last, so get there early to get the best selection.